Filming of the documentary short Twenty Eight Feet: Life on a Little Wooden Boat this past winter in the Caribbean started out with a slight hiccup. Longboard skateboards shipped from Canada by director Kevin Fraser went mysteriously missing at the other end in Martinique. "It does bring a smile to my face however when I think of the possibility of two customs and immigration officers' kids skateboarding the hills of Martinique on our longboards," blogs ship captain David Welsford about his suspicions. "What can you do?? Absolutely nothing, but smile and remind ourselves... this is the Caribbean!" We spent time living, working and hanging out all over North America. 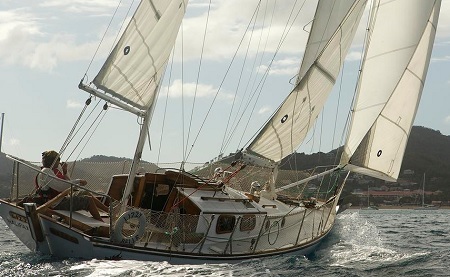 We have learned how to counsel young campers in Pennsylvania, launch off snow covered peaks in the Rocky Mountains while snowboarding, we've driven across the country together and now we can say we sailed Lizzy Belle throughout the Windward Islands of the Southeastern Caribbean... and made a documentary on sailing and the lifestyle of a sailor. Working with Dave has spoiled me, I don't think I'm likely to find another documentary subject who has anywhere close to as much enthusiasm and ambition. Also Dave being a creative mind and a photographer made our collaboration strong and productive. He pushed me to shoot and would do absolutely anything to help me get the content I dreamed of. Now I just hope I can cut it into something worthy. Wish me luck. Since sharing those thoughts, Fraser has crowdfunded some additional money to submit Twenty Eight Feet to dozens of festivals. Following an encore showing at the Atlantic Film Festival on September 19th, this one should enjoy a long and (almost as exciting) journey on the festival circuit.